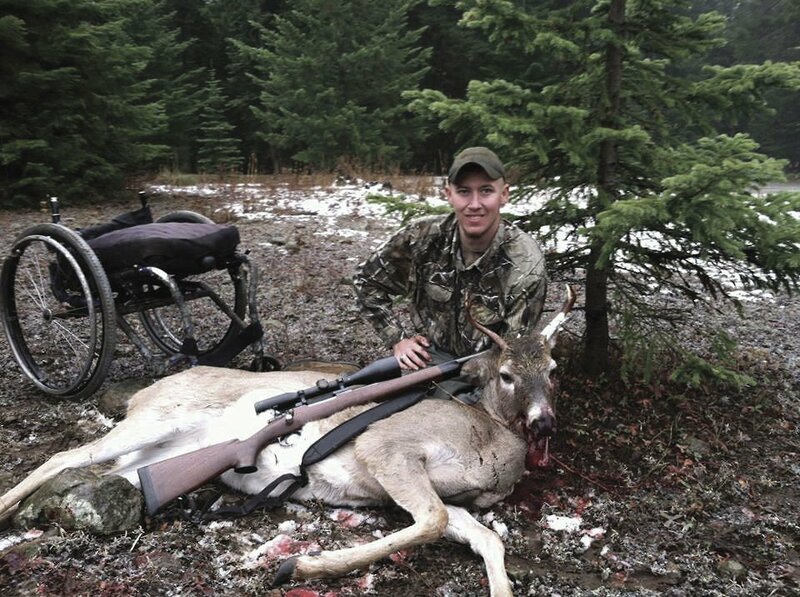 Grangeville’s Tom McAdow is a successful year-round hunter, utilizing his wheelchair to gain access to not only his daily work and social life, but also to the backwoods. 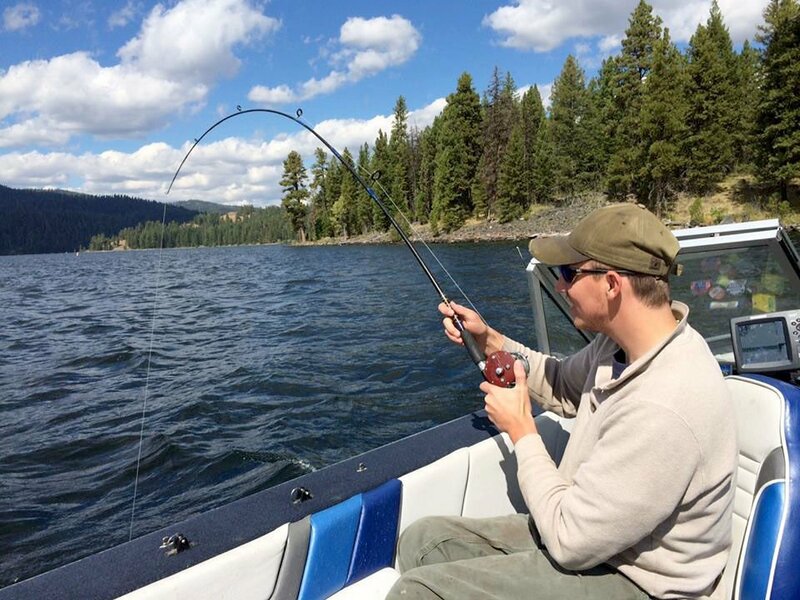 McAdow enjoys some fishing in his leisure time. Tom McAdow and Keri Thompson were married in September at McCall. GRANGEVILLE — The past seven years have been hard rows to hoe for 22-year-old Tom McAdow. But don’t offer ahim any sympathy – that’s not what he’s looking for. The morning of Nov. 13, 2007, started out like many of McAdow’s fall days: The 15-year-old was on a hunting trip with his grandfather, George Casteel, at McCallister Campground. “I remember everything from that day, crystal-clear,” he said. McAdow and his grandfather got up early on the crisp, cool morning. Their companions on this trip were McAdows’s Uncle Dave Gates and his then 8-year-old cousin, Ethan. The hunters took off on four-wheelers, enjoying their ride along the South Fork They thought about riding toward Cougar Annie’s and ended up along the way toward McComas Meadows to look for whitetail. “I saw a gravel hill and, well, I just had to go for it,” McAdow smiled. McAdow was a freshman at Grangeville High School at the time and lived for two things, he said: the outdoors and football. “You could say I was adventurous or maybe even reckless,” he added. He was in third gear on the four-wheel climb up the gravel hill when he lost momentum and the tires began to dig in deep. He recalls the slow-motion tumbling of the four-wheeler over his head, his left boot being stuck and briefly blacking out. McAdow told his grandpa he would be all right — but he also knew his grandfather had served in Vietnam and saw field injuries. When he told Tom to hold still, he thought his back was broken, he did. While his uncle held his head and talked to him, Casteel rode for help. Forty-five minutes later an ambulance arrived from Grangeville. More than six hours after arriving at Syringa Hospital, he was taken to Lewiston where surgery to remove a small blood clot was immediately halted when a much larger, more dangerous clot was discovered. “I was given blood thinner, then the surgeries started,” he said. McAdow’s broken back was repaired at St. Joseph’s with a rod and four bolts. He soon was moved to St. Lukes Rehab. McAdow learned to operate a wheelchair, navigate around obstacles, cook and do laundry —all from a wheelchair. “It was hard work – you don’t realize how hard it is, exhausting, until you try,” he said. However, his goal was to be home by Christmas so he focused on what needed to be done. On Christmas Eve, he was released and returned to Grangeville to a ramp built by friends and family that led him to his trailer home with his mom and brothers (his parents are divorced and his father is remarried). “There was a big sign from all my classmates and it was just so good to be home,” he said. It wasn’t long before McAdow decided he wanted to be back at school. On opening day of turkey season in 2008, McAdow felt the familiar urge to be in the woods. McAdow has been one of North Idaho’s best youth shooters, attending events with his family. Those years of experience served him well as he learned to adjust to the drastic changes in his lifestyle. McAdow planned to drop out, he said, when he knew he would not be able to graduate with his class. He gives a lot of credit to GHS teacher Sally Payne who encouraged him to keep plugging away. “I did not have good grades, I did not enjoy it, but she kept me focused – as focused as possible,” he laughed. In 2012 he graduated. Although McAdow remained positive on the outside, he battled some demons in the form of alcohol and some reckless choices. He spent time applying for jobs locally when he finally answered a Free Press help wanted ad for Interwest Wood Design, owned by Kurt and Kelly Newson, outside of Grangeville. He got the job and has been working there for the past year or so. “I like working with my hands, it’s hard work and a good outlet,” he said. McAdow drives a truck with hand-controls and even built his own chairlift for the vehicle. He lives and breathes the outdoors, loading and unloading his own aluminum boat to go fishing, and wheeling, four-wheeling and snowmobiling into remote areas to feed his hunting and extreme sports addictions. A year ago, a woman came into McAdow’s life and changed something about him: “I thought I would never get married. Some people might think that’s because I’m in a wheelchair, but I knew it was because I’m married to the outdoors,” he laughed. “Suddenly after a few dates I felt I could spend the rest of my life with this person,” he said. McAdow married Keri Thompson in McCall in September. She works in home health and as a caregiver. Through eight major back surgeries, a few moves, dealing with people and insurance, McAdow said he has learned a lot about himself. Although he has read up on new prosthetic and “bionic “ leg information, McAdow is realistic about his future. He said there is no use in whining and complaining about what happened in the past.